If you’ve been following local esports at all over the past year then you’re probably familiar with Project Destiny. It has been covered extensively by local and international esports media. Suffice to say, Bravado Gaming’s CS:GO team moved to America with the aim of competing at the highest levels. After initially struggling to find their footing, they enjoyed some success towards the end of 2018. On the 3rd of December they had a dream underdog run at DreamHack Winter where they placed second, the very next weekend they won the South African World Electronic Sports Games regional qualifiers, and just before Christmas they secured the DreamHack India title. Not a bad month at all. 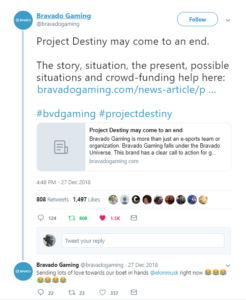 However, on the 27th of December Bravado Gaming published an article titled, “Project Destiny may come to an end” on their official website. The long and short of the post? There was no more money left to send the CS:GO team back to America in 2019. 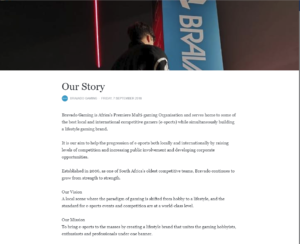 The expenses incurred by Bravado Gaming due to Project Destiny were costly, negotiations with companies hadn’t secured additional funding, and the organization itself was in debt. As a result, they made the call to bring the team back to South Africa. Well… not quite. The article ends with a plea to the CS:GO community at large to help Bravado Gaming via crowdfunding platform Indiegogo. The goal was set at $30,000 (approx. R400,000), which would cover another three months in America. Reactions to the campaign were mixed. 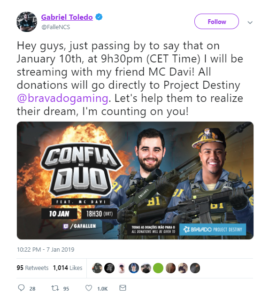 Well-known Brazilian Gabriel “FalleN” Toledo got behind the campaign in an attempt to raise funds for Project Destiny. FalleN hosted a fundraiser stream on his Twitch channel on the 10th of January, raising around 17,000 Brazilian Real ($4,500). Dan “apex” Madesclaire also got involved in the fundraising effort on his Twitch channel. Some supporters weren’t so eager to donate money to the cause, and concerns were raised about the crowdfunding campaign itself. Sam “Tech Girl” Wright spoke to Bravado Gaming CEO, Andreas “Cent” Hadjipaschali in a revealing Red Bull article about funding avenues, challenges, and how the crowdfunding campaign would only cover the essentials. Cent mentions that should the crowdfunding campaign fail, there were still other potential options that Bravado Gaming were exploring in a last ditch effort to fund Project Destiny. Regardless, as each day went by, the dollar amount on the campaign counter continued to tick upwards – albeit slowly. The Indiegogo campaign was certainly an interesting one to watch. On the 6th of January Bravado Gaming had already reach 29% of their $30,000 goal. By the 13th they were at 47%, but the campaign end date of 22 January was a little over a week away. It started to become less and less certain they’d be able to reach their target. On the 17th of January, probably as a result of the looming 22 January deadline, Bravado Gaming extended their Indiegogo campaign (shifting the deadline to 31 January). However, an abrupt announcement on the 26th of Jan brought the crowdfunding initiative to a screeching halt. Bravado Gaming cancelled their Indiegogo campaign with immediate effect and assured backers that they would be reimbursed in full. They still had five days on the clock… What gives? Bravado promised a press release to update everyone in the coming week, so keep your eyes glued on their social media accounts. In this maelstrom of uncertainty all we’ve heard are wildly different rumours. Some speculation indicates that Bravado’s poor performance at the Americas Minors Championship – Katowice 2019 is the reason that the organization has pulled the plug on Project Destiny. Bravado Gaming progressed through the qualifiers and ultimately earned a spot in the $50,000 Minor. Their goal here would be to finish in the top two and earn a spot in the IEM Katowice Major 2019. The tournament started on the 22nd of January. Sadly, the team didn’t even make it out of the group stage. 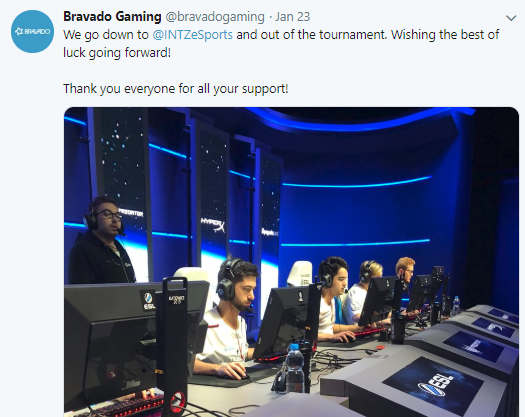 Bravado got out of the blocks early, beating INTZ 16-12 on Train, but then lost to NRG (8-16 on Inferno and 7-16 on Train). This set-up a rematch against INTZ, with a spot in the playoffs on the line. INTZ dominated early, beating Bravado 16-3 on Inferno. The second match was closer, but INTZ walked away 16-12 winners on Mirage. Sadly, Bravado Gaming’s dream of a Katowice Major came to an early end. Did this result also sink Project Destiny? What was clear from the Tech Girl Red Bull article is that Bravado Gaming weren’t just relying on the crowdfunding campaign to keep Project Destiny alive. Cent revealed that they were still actively searching for partners who would help the organization continue their development in America. Speculation indicates that Bravado Gaming might have found that funding and thus no longer required money from the esports community. So, in a rags to riches tale, they decided to give it all back before reaching the $30,000 goal. 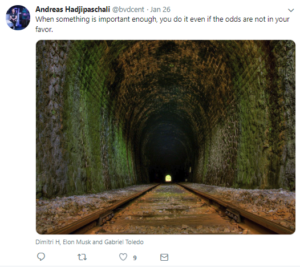 The same day Bravado Gaming announce they’re cancelling their Indiegogo campaign, Cent posts a cryptic Tweet with obligatory Elon Musk tag. Inb4 Musk buys Bravado Gaming. Another bit of speculation is that the entire roster, or some key Bravado Gaming CS:GO players, have been cherry picked by other organizations. Without a full squad (or a squad at all), Bravado Gaming was forced to cancel its crowdfunding campaign. While this would be a huge blow to the organization, I could live with it provided some of the players could still follow their CS:GO pro dreams. I can tell you that I personally didn’t donate to the Indiegogo crowdfunding campaign. It isn’t because I don’t care. I’ve never played CS:GO but I’ve watched a ton of their matches since they left South Africa. We’ve also written about them extensively here at Esports Central and followed Project Destiny closely. I want them to succeed. It also isn’t because I don’t want the players to go overseas. In fact, I think that’s the very reason I never felt comfortable making a donation. If it were the five CS:GO players and coach crowdfunding themselves sans an organization, then I’d have donated in a flash. Instead – the crowdfunding campaign came from the organization, and it just felt disingenuous. 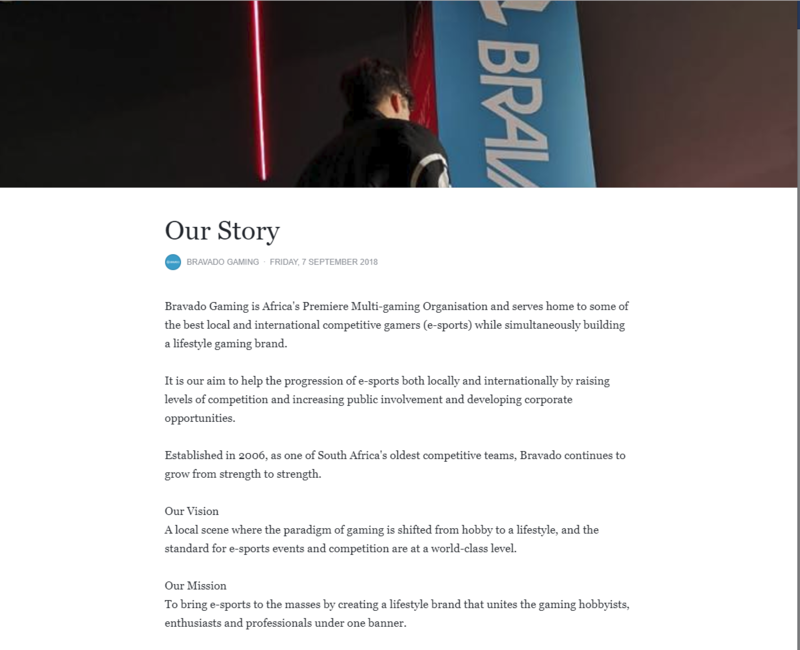 Bravado Gaming is a privately owned organization that describes itself as “Africa’s Premiere Multi-gaming Organisation”. As such, going to the world hat in hand is quite honestly the antithesis of the Bravado Gaming brand. It doesn’t track with how they’ve interacted with the local community in the past. They could have done more to allay concerns about funding an organization over the players. Image courtesy of the Bravado Gaming Facebook page. The fact that there were no perks for anyone who donated towards the $30,000 didn’t help either. This just junked the entire endeavour for me. Why not do something as inexpensive as getting your players to wear Bravado Gaming shirts signed with the names of backers at the next international LAN they attend? There are probably reasons for these decisions, but from where I’m sitting I just didn’t feel as invested in Bravado Gaming as I do in their CS:GO players. All we really know is that Bravado Gaming cancelled their Indiegogo campaign. That it came so soon after Bravado’s unceremonious exit at the recent Minor could just be a coincidence. In fact, the cancellation could also be ascribed to the pending deadline of the Indiegogo campaign. It seemed highly unlikely to me that the $30,000 target would be met in time, but we’ve seen successful last ditch crowdfunding efforts before. While it seems like a silly thing to say, the only thing we can do is wait to hear from Bravado Gaming directly. I’m betting on that Elon Musk money, though.